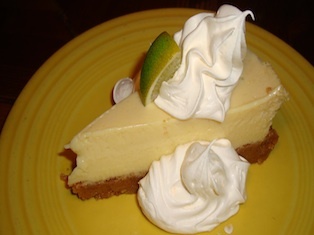 A homemade tropical delight with a graham cracker crust topped with whipped cream and fresh lime. Mango slices served over crispy cinnamon sugar strips topped with vanilla ice cream, caramel sauce and powdered sugar. 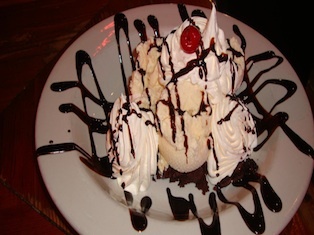 Homemade brownie filled with dark chocolate chips topped with French vanilla ice cream, hot fudge, whipped cream and a cherry on top. Homemade bread pudding topped with caramel rum sauce and vanilla ice cream. Vanilla ice cream topped with chocolate and caramel sauce, pecans and whipped cream. Vanilla ice cream served with your choice of chocolate or caramel sauce.